I have stopped reading the news, I don't need to. About one million Iraqis have cast their ballots during early voting in Iraq, three days ahead of the country's parliamentary election. The vote on Thursday was overshadowed by violence as a series of blasts killed at least 14 people and wounded 57 others at polling stations in the capital, Baghdad. 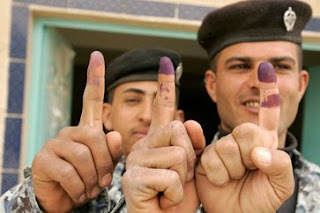 Frankly, do you need an exposé on Iraqi "democracy", Do you really need words ?